The numbers do not lie. As stated in a previous post and its referenced links, the payment gap between primary care and specialists has increased since the American Medical Assocation started the Resource-Based Relative Value Scale (RVS) Update Committee (“RUC”) in the early 1990s. It is difficult to separate the two when the Center for Medicare and Medicaid Services (“CMS”) has accepted over 90% of the RUC’s recommendations throughout the years. This can be interpreted in a number of different ways but let’s be honest – I am a current intern and do not have enough time to go through the different interpretations – I will leave that up to your comments. The AAFP has also put the AMA and RUC on alert by sending a strongly worded letter to RUC chair, Barbara Levy, MD, demanding 4 additional true primary care seats, 3 seats for outside entities (ie consumers, health plans, health systems, employers), a seat for geriatrics, elimination of 3 rotating subspecialty seats, and implementation of voting transparency. I have little hope that these changes will occur and even if they did, they would still not represent the substantial primary care voice needed to adequately value primary care. Fortunately, the AAFP also created a new Primary Care Valuation Task Force to make recommendations to CMS on how to appropriately value primary care. Some may see bias in that a primary care organization is forming its own committee to value primary care services, though the task force also includes members that represent the many sub-specialists within their organization (American College of Physicians, American Academy of Pediatrics, American Osteopathic Association). It also includes outside entities (much like those demanded in the letter to the RUC) in addition to being transparent in its operations – all of which the RUC does not do. CMS has taken a strong interest in this task force, sending representation to meetings and following along with its progress. It will be interesting to see the first set of recommendations brought forth by this task force as well as what, if any, recommendations are implemented into primary care payment valuation and reimbursement. We have seen the evidence in regards to the increasing payment disparity between primary care and specialists. We also have evidence showing the varying levels of medical student interest as primary care valuation increases and decreases (seen inthis post and in the chart below). No matter what outcome Dr. Fischer’s lawsuit has or the progress of the AAFP Task Force, the youth of medicine has a chance to make a bold statement. We have a chance to show those in power within the house of medicine that the current process does not properly value cognitive care, provide transparency, support preventive care, nor reflect or recruit the workforce our country needs. You can call it idealism. I call it social justice. What I can offer is a plea to residents thinking about practicing primary care, medical students thinking about primary care residencies, and premedical students who are aspiring future primary care physicians. There are a few great choices to choose from in regards to how you support this movement. You can choose to support the Georgia docs’ lawsuit by going to this website to make a contribution to their legal defense fund. You can also choose to support the AAFP in advocating for its primary care valuation efforts by supporting FamMedPAC (there is contact information for non-members, medical student membership is free if you’re not already a student member). You can write your members of Congress by using this simple tool to send a letter in support of primary care. You can even choose to do all of these things! 1 – Take a moment to reflect on your personal statement for medical school. Numerous medical school admissions committee members that I have had contact with over the years stated that if they were to predict specialty choices based solely on admissions personal statements, that an overwhelming majority of future medical students should choose primary care. If you are part of that majority, no matter where our specialty-dominated education has taken us throughout the years, then you should support these efforts. 2 – Remember your current and future patients. Think about patients that do not have access to you or to a primary care physician. The current valuation of services supports procedural and reactive medicine rather than cognitive and preventive care. It supports ivory-tower tertiary care specialty centers and puts community hospitals and private/solo practices at a disadvantage leading to a mal-distribution of physicians – mostly primary care physicians– not this so called “shortage” of physicians. One small but important step to help the redistribution of physicians to where they are needed most is to support these efforts. 4 – Stay true to your passion. Not many people can say that they are physicians. 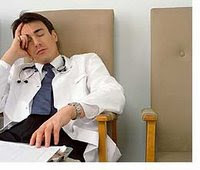 Unfortunately, less and less are able to say that they are primary care physicians. I have had so many people tell me “it’s not about the money. It’s about the money.” Why does a committee dominated by specialists who refuse any attempts at transparency, fair representation for primary care services provided, or proper valuation of care that provides more benefit for morbidity and mortality have to make it about the money? Because when it all comes down to it, it’s not about the money… right? Kevin Bernstein, M.D., M.M.S. is a family medicine resident, co-founder of the Future of Family Medicine Blog, and a leader in the Family Medicine Revolution (#FMRevolution). Outstanding commentary. The critical need for cognitive medicine is going unanswered and we will all pay a very steep price for that. Waste, inefficiency, over-utilization, over-worrying, over-diagnosing, over-treating and over-prescribing are all trappings of an undisciplined system of care, where money is such a powerful attractant and motivator. Medical education somehow scoffs at primary care as some sort of failure to strive for or reach potential as a physician, when in truth the skills required to be a primary care doctor are among the most demanding and productive. Proceduralist medicine is fine and valuable if it is disciplined and employed correctly. But the cognitive core of medicine is where society will find the real hope of integrating quality, cost-effectiveness and enduring doctor-patient relationships.